Looking for some good pulled pork recipes? Keep reading to find out how you can transform pulled pork into practically every kind of dish! Hearty Pulled Pork Recipes Nobody Can Resist! There’s something so terrific about pulled pork. It’s seeing bland chunks of pork transform into tender shreds of flavorful meat. I was in awe when I had my first pulled pork dish. I can still taste its invigorating barbecue sauce! Since then, I’ve consistently made pulled pork recipes because they’re one of those dishes you can eat whenever, wherever. If you’ve always wanted to have a signature go-to dish which everyone will love, then you’ve come to the right place! This Mexican cuisine staple has been made with beef, cheese, and even grilled chicken. It’s about time we make it with some tender pulled pork! Pulled pork quesadillas are perfect for a party or even a lazy Sunday spent hanging out on the patio. Everything seems to be better with a southern twist. And pulled pork recipes are no exception! The great thing about this southern style pulled pork recipe is it shows you how to make the perfect coleslaw to go with your meat! Yes, you read it right. Cooking pulled pork in Dr. Pepper! A crazy idea? Just crazy enough to be your next favorite dish! This Dr. Pepper pulled pork recipe tastes savory yet sweet, spicy yet refreshing. This kind of innovation is what pulled pork recipes are all about. 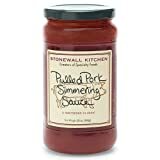 Of all the pulled pork recipes I found, I was a bit worried about this one. Mac n’ cheese is already an all-time favorite dish, why mess with it? Well, I have never been more wrong. This pulled pork mac n’ cheese takes a classic dish to a whole new level! As much as we’d like to have pulled pork as often as we can, sometimes we simply don’t have the time to transform them into something fancier. For this problem, a simple pulled pork hash is the answer! Eating it with eggs makes it extra rich and filling, you might not want to make your pulled pork any other way! Who says pulled pork recipes are all about entreés and appetizers? You can also make an amazing dip with pulled pork! Imagine getting 90% of your satisfaction from the dip alone. This is a must-try! What did I tell you about pulled pork being so versatile? From dips to hash, now we’re making pulled pork tacos! The tender texture of pulled pork in contrast with the crunchy taco shell is simply irresistible! Adding the avocado cream creates a medley of flavors you didn’t know was possible! 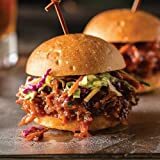 While this list of pulled pork recipes is about innovation and new ways of cooking, a good old-fashioned saucy pulled pork sandwich is hard to beat. I’d say this pulled pork sandwich is one of the best sandwiches I’ve ever had—with or without meat. I won’t even try to deny it. Pulled pork recipes aren’t exactly the healthiest recipes out there. But there are always ways to make it more nutritious without losing its goodness! This pulled pork with dirty quinoa is a fine example of a meal that’s both healthy and hearty. Eggs Benedict is often good on its own. But how can you resist not eating some with pulled pork? Their textures complement each other so well, and the combination of flavors is unforgettable. I’m calling it: pulled pork eggs Benedict will soon become a classic dish. A good pulled pork chili is good enough for me. But pulled pork chili made with cinnamon-roasted pumpkin seeds? I am reminded why pulled pork recipes are one of the culinary gods’ greatest gifts. A lot of us find ourselves having to deal with leftover rice. There are a thousand ways to fry it but this pulled pork fried rice is one-of-a-kind. No need to find anything else to eat with your rice. Every flavor and every food group are all here! When I want my party guests to have a good time, my go-to dish has always been nachos. But I’ve made it so many times I needed to find a way to change it up! These ultimate pulled pork nachos are what I’ve been looking for! All the goodness of a classic Mexican food made even better with tender meat! Yes, you can also make an amazing pasta dish with pulled pork! The amazing thing about the tenderness of pulled pork is it goes so well with pasta! Their textures are so close to each other you’ll enjoy every mouthful! Tacos, nachos, and now burritos! I won’t be surprised if by next year, all of Mexican cuisine can be made with pulled pork! This pulled pork burrito recipe also comes with a creamy tomatillo sauce. If that’s not satisfying, I don’t know what is. I don’t know what I like better: pizza or pulled pork. Good thing I don’t have to choose! This pulled pork pizza is so fool-proof you can play with the kinds of sauce and cheese you want to have. The possibilities are endless! I love tamales, but they take a lot of effort and patience to make! This pulled pork tamale recipe shows you how you can make tamales and pulled pork faster and with less work! Good food with minimal effort? I know I’m a foodie, but I can get used to it. I’m sure it took a lot of strength to finish this article without leaving your seat and making one of these pulled pork recipes! But I can’t blame you if you’ve already put those chunks of pork in the slow-cooker. I’d do anything to have these scrumptious pulled pork recipes right now! Whether you’re preparing for a special occasion or just craving for a good ol’ homemade dinner, you can’t go wrong with a smash-hit pulled pork recipe. Remember to make twice as much as you think you need because these recipes are so good, I’m sure everyone will keep coming back for more! Want more tender and meaty dishes like these pulled pork recipes? Try this Pulled Chicken Burger Recipe! Which pulled pork recipe are you going to make first? Let us know in the comments section!